Miles Gilbert “Tim” Horton (January 12, 1930 – February 21, 1974) was a Canadian professional ice hockey player, defenceman, playing 24 seasons in the National Hockey League for the Toronto Maple Leafs, New York Rangers, Pittsburgh Penguins, and Buffalo Sabres. He was also a businessman, and co-founder of Tim Hortons. 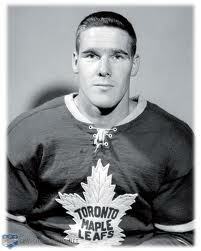 Tim Horton was born in Cochrane, Ontario, at Lady Minto Hospital. His parents were Aaron Oakley Horton (a Canadian National Railway mechanic) and Ethel Horton. Tim had one brother, Gerry Horton. His father of English descent, and mother of Irish descent, the Hortons moved in 1935 to Duparquet, Quebec, returning in 1938 to Cochrane. 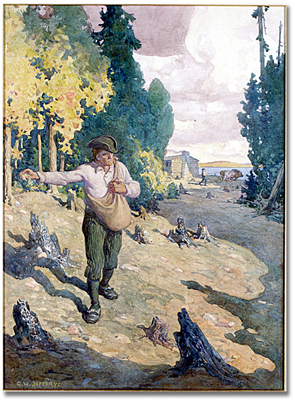 In 1945, Tim and his family moved to Sudbury, Ontario. Tim Horton grew up playing ice hockey in Cochrane, and later in mining country near Timmins. The Toronto Maple Leafs organization signed him in 1949 and performed as one of the steadiest defensemen on the blueline throughout his 22 years in the National Hockey League. He played in 1,446 regular season games, scoring 115 goals and 403 assists for a total of 518 points. Outside the rink, Tim was just as sharp. He realized that his hockey career would not last forever and sought to find a clever way to add to his hockey salary. After many summers of hustling to make an off-season living, Tim decided to try his luck in the coffee and donut business. 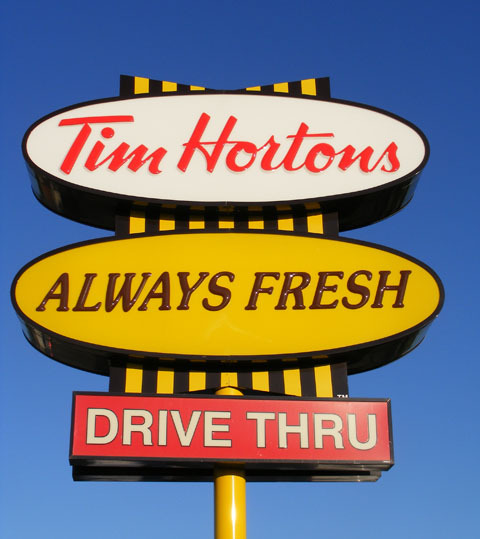 The first Tim Hortons franchise opened in 1964 in Hamilton, Ontario. In 1967, with three restaurants in operation, Tim became full partners with former police officer and franchisee of Tim Hortons Restaurant #1, Ron Joyce. Since then, Tim’s signature has become a prominent fixture in the Canadian landscape. Sadly, Tim did not live to witness the chain’s great success. He was traveling back to Buffalo from a game at Maple Leaf Gardens when he was killed in an automobile accident on February 21, 1974. The Buffalo Sabres retired his Number 2 sweater as a tribute to his memory. At the time of Tim’s death, there were 40 Tim Hortons restaurants. Tim Horton always considered his good fortune in the proper perspective. He was modestly confident about his abilities, was approachable, generous and considerate. His memory will always be held dear by family, friends, players and business associates alike. Following Horton’s death, his widow, Lori, of her shares for $1 million, a deal she tried unsuccessfully to re-open years later. One of Horton’s daughters went on to marry Ron Joyce’s son. The company and the legend continue to thrive. I am an English as a second language teacher. I wish to use the photo of Tim Horton you have on your website. it will be used in an exam for grade 7 students in Québec, Canada. Firstly, I wish to use it to accompany a description of Tim Horton ( for eudcationl purposes). Also, the exam will possibly be sold on a site like teacherspayteachers.com Could you please tell what I need to do for permissions to be granted to me. Thank you for a swift reply.